Double sided blackboard / sandwich board suitable for sign board or menu board in or outside café, salon etc. 115cm high x 56cm wide x 55cm deep. 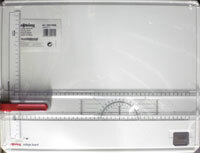 Drawing board for sheet sizes up to 450 x 325mm. Straight edge guide slots on all four sides with signal humps. Parallel straightedge with grip area and STOP-and-GO button. Additional metal clamp.